Christmas is one of the biggest and most important dates in the retail calendar for almost every business. Last year the average person in Britain spent around £868 on their Christmas celebrations. That figure doesn’t sound like something you would want to miss out on. 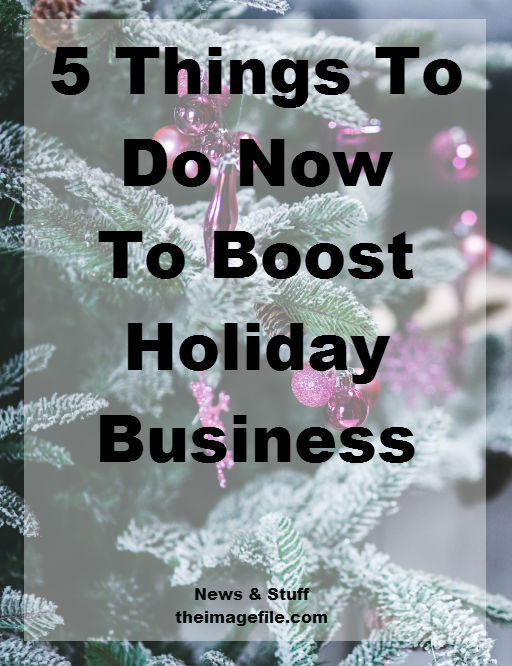 So here are five things you can do RIGHT NOW to boost your holiday business! It’s important to review your past statistics if you want to maximise every sales opportunity (which I’m assuming you do). By analysing last year’s seasonal figures you should get a clear picture of which services/packages and products were the most popular. Also passing an eye over your previous financial performance should give you a good idea of when you sell the most. This will be useful when you’re planning to announce promotions and discounts in the coming weeks. Once you’ve taken a look at your historical information you can make informed decisions about what to offer your clients this year that you know will be in high demand and cause the most cash flow. We covered this in our previous blog post but just so we’re clear – it’s never too early to start putting the foundation blocks in place. For many business owners November and December are one of the busiest periods so make sure you’re on the ball and ready to go when a flurry of bookings come in. Don’t leave all your planning until the 1st of December! The majority of us now sell primarily online so it’s important that your website information is current, your portfolio is up to date, your purchase policies are clearly explained and any special Christmas offers are featured prominently. If you do have a physical premises or you conduct face-to-face selling, check you have enough printed literature (e.g. price lists) and sample products available for clients. People are more likely to purchase a product if they have an experience with it so make sure you give clients the opportunity to see prints and canvases in reality if they wish to. You may not be thrilled about listening to ‘Rockin Around The Christmas Tree’ in late October but it’s a firm fact that Christmas offers and festive adverts are being displayed earlier and earlier. But as they say; ‘if you can’t beat them, join them’. It’s important to start finalising (or at least thinking about) your Christmas marketing plan now. Which marketing channels are you going to use to communicate with your customers? Will you focus on social media? Local newspaper ads? Email newsletters? Or an in-studio open day? If you plan to use printed products for marketing, such as flyers or direct mail, then get them designed and printed now so that they’re ready to go. Also if you are offering any incentives during the Christmas holidays make sure they’re nailed down and prepared. Communicate them early to clients as some consumers begin looking for great deals months in advance. Christmas is the time of giving and there’s no better gift to the stressed-out shopper than a decent promotion. Try to come up with at least 2-3 great discounts and offers which can then be spread over the coming weeks to boost customer interaction and sales. These don’t have to be elaborate or take forever to prepare. You could simply offer free shipping when customers spend a certain amount or offer exclusive out of work hours photo shoots (e.g. after 6pm for those who work during the day or at the weekend). On the other hand you could have promotions that target different groups of people e.g. a promo code for past clients, a special ‘Christmas Price’ if customers book your services before a certain date and a discount to any last minute shoppers who spend over a certain amount. Now we all know that we’re meant to be consistently blogging, selling and present on social media but if we’re honest sometimes things just get left behind. So now is the time to rectify the situation and pull our socks up. Your blog hasn’t seen much action lately? Plan some awesome festive blog posts to put out over the next few weeks. This will show the search engines some activity (which they love) and prove to anyone who stumbles upon your blog that you are still alive and kicking. Also remember to ‘stick’ any special promotions to the top of your blog so customers can’t miss them. Left your social media to go a little stale? Well when it comes to social media, anything is better than nothing. Share your offers and discounts on your social channels, put out an update about your latest blog post or even retweet or share other people’s content – anything to show you’re active. What advice do you have for getting your business ready for the Christmas rush?